A diverse, exciting, and smart read! 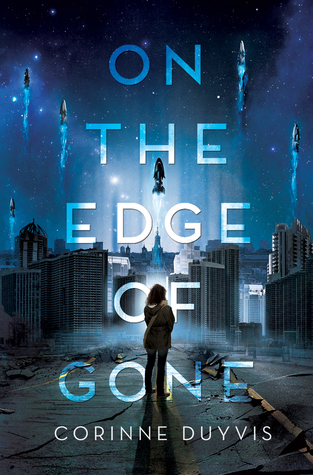 On The Edge of Gone is exciting, different, and introspective. It is unlike any sci-fi book I have read and that is a high compliment. While, in my opinion, this book was not quite as amazing as Otherbound, an all-time favorite, I still loved the story and heartily recommend picking it up. This was on of my most anticipated 2016 releases and it didn't disappoint! Similarly to Otherbound, On The Edge of Gone features amazing diversity that is written about with tact and care. Our amazing main character, Denise, is autistic and biracial. There are also many characters of different backgrounds and sexual orientations. I LOVED seeing so much representation and publisher/authors/readers should take note. The book entirely takes place on Earth and focuses on Denise's quest to obtain a coveted spot on a generation ship after worldwide disaster (AKA the comet). Her life almost surely depends on it. The story itself is ingenious and presents with the readers with unsettling moral ambiguities. Is it right that, in the event of a terrible disaster, only a few of the most "valuable" people are saved. How can that be determined? While the content checks all the right boxes, I also found the actual story and writing to be emotional and enthralling. The tense family bond and struggles between Denise and her mother were heartbreaking. The "ship" (relationship NOT space ship) was cute but didn't overtake the plot. There were also cats. And an evil chapter that broke me.